Generally considered to be a flavoring or condiment that is used for enhancing the taste of other foods. Also known as Browned Butter, this food enhancer is created by melting butter so the milk solids begin to brown. As the butter is heated, it turns brown in color, providing a nutty and complex flavor when heated to a faint golden color. If allowed to brown too long, it becomes dark in color and burnt in flavor. To prepare Brown Butter, use 1 pound (stick) of cold, unsalted butter placing it in a cold sauté pan. 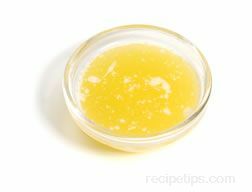 On a stovetop burner set at a medium temperature, begin to melt and simmer the butter, being careful not to let it burn. After several minutes, the butter will begin to foam, which is caused by the heating of the milk solids. As the foam drops to the pan bottom, it may begin to burn so use caution in allowing too much heat to reach the butter, making sure it does not become blackened. As the butter begins to turn into a caramel colored liquid with a rich, nutty aroma, start to decrease the amount of heat so it does not burn. Remove it from the burner and allow it to cool for approximately 10 minutes. It can then be clarified pouring the butter through a fine mesh sieve, cheesecloth or coffee filter into a heat proof bowl or container. Once it is completely cooled by still in a liquid state, pour it into an airtight storage container for longer term refrigerated storage, if it is not to be used immediately. Brown Butter is used as a sauce to add flavor to eggs, vegetables, fruits, meats such as poultry and fish, pasta, and various desserts. Additional seasonings that can be added to the butter include a little lemon juice, pepper, kosher salt, or possibly some bits of herbs such as parsley or cilantro. Brown Butter can be refrigerated in an airtight container for use within several weeks or frozen for future use, but when reheating frozen butter use a low burner setting, being very careful to only melt the mixture and not allow it to burn.